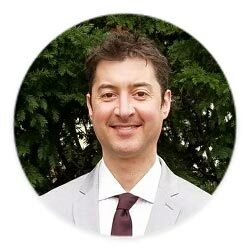 I am so pleased to introduce Dr. William Lagakos who has accepted my request to write an article for my blog! He is an expert in obesity, inflammation, and insulin resistance. 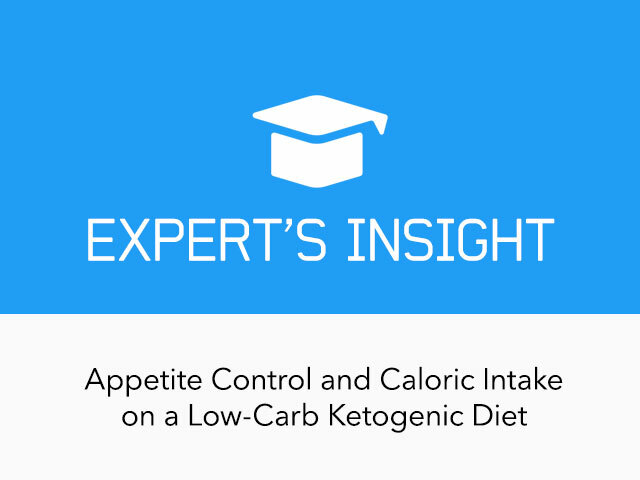 In this post, Bill will present the findings from three recent controlled trials focused on the effects of low-carbohydrate vs low-calorie diets on appetite and weight loss. Bill runs his own blog and has authored his best-selling book, The poor, misunderstood calorie, which is one of the best resources on human energy metabolism. As most of you who follow the ketogenic diet know, "calorie is not a calorie" but calories are not insignificant: caloric intake definitely plays a role in weight loss. The regulation of appetite is a complicated thing, with many players and many, MANY moving parts. One of these parts is diet composition. That is, ‘what’ you eat impacts ‘how much food’ or ‘how many calories’ for which you’re hungry. One theory is that carbohydrates are a major driver; as restricting them is very effective at reducing appetite in obese populations. 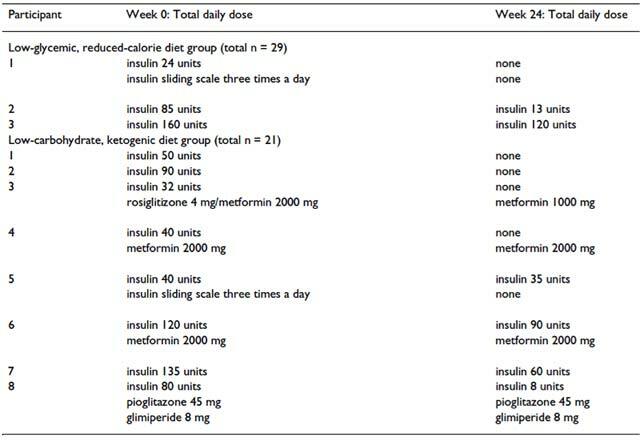 In 2008, Westman and colleagues compared two diets of vastly different macronutrient compositions in a population of obese type 2 diabetic patients (Westman et al., 2008). Participants assigned to the first diet were instructed to limit their carbohydrate intake to fewer than 20 grams per day, but they could eat as much of whatever else they wanted (a ketogenic diet). Those assigned to the second diet were instructed to actively restrict food and fat intake by 500 kilocalories (calorie restricted diet, “CR”). Prior to starting the study, calorie intake for participants in both groups was ~2128 kilocalories per day. After 24 weeks, calorie intake by those assigned to the ketogenic diet spontaneously declined by almost 600, or 30%. Calorie intake in the CR group declined by almost 800, ~40%, via monitoring, calorie counting, and actively restricting intake. 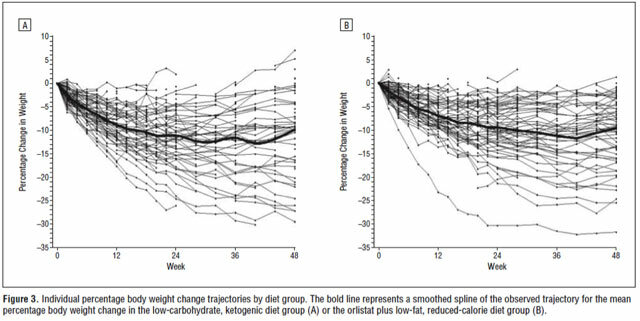 Interestingly, despite undergoing a greater reduction in food intake, the CR group lost significantly less weight than the ketogenic group (24 vs. 15 pounds, or 10 vs. 7% of starting body weight). This may have been due to the ability of carbohydrate restriction to preserve energy expenditure to a greater degree than fat restriction, as demonstrated by Ebbeling and colleagues (Ebbeling et al., 2012). Thus, reducing carbohydrate intake spontaneously decreased appetite and this was accompanied by accelerated weight loss. 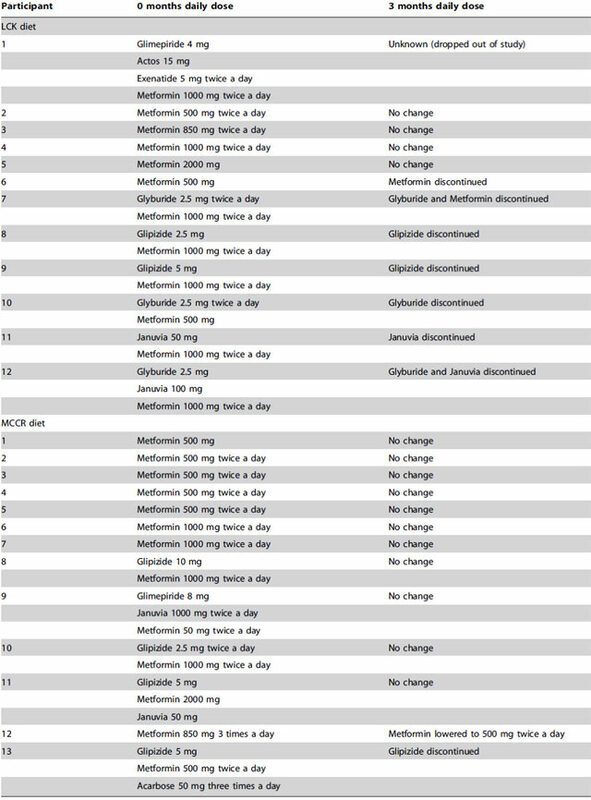 Furthermore, 3 of the 29 participants (10%) in the CR group were able to reduce or eliminate their diabetic medications whereas 8 out of 21 ketogenic (38%) dieters were able to do so. In 2010, Yancy and colleagues did a variation on this by comparing a ketogenic diet to a calorie restricted, low fat diet supplemented with the weight loss drug Orlistat (Yancy et al., 2010). Orlistat works by inhibiting fat absorption, leading to steatorrhea (fatty diarrhea) if dietary fat isn’t adequately restricted. After 48 weeks, dieters in both groups reduced calorie intake by approximately 30%. In this study, reducing dietary carbohydrates led to a spontaneous reduction in intake that matched what the participants were able to achieve by actively ‘counting calories’ and restricting food and fat intake. And interestingly, yet again, the ketogenic dieters lost slightly more weight (25 vs. 21 pounds). Furthermore, Orlistat reduces fat absorption, so, similar to the Westman study (above), the energy deficit may have been greater in the low fat diet group, yet still, weight loss was greater in the ketogenic diet group (speculatively, due to the impact of carbohydrate restriction on energy expenditure mentioned above). Lastly, the need for antidiabetic medications decreased for 81% of the ketogenic dieters and 68% of the Orlistat + low fat diet group. In 2014, Saslow and colleagues compared a ‘moderate carbohydrate, calorie restricted (MCCR)’ to a ketogenic diet in diabetic patients for 3 months and showed similar results (Saslow et al., 2014). Those assigned to the ketogenic diet spontaneously reduced intake by ~700 kilocalories per day whereas those actively restricting fat and food intake achieved a slightly greater reduction, 800. However, similar to the findings of Westman (Exhibit A) and Yancy (Exhibit B), ketogenic dieters lost significantly more weight (12 vs. 6 pounds). Orlistat blocks fat digestion thus reducing its absorption. This means that while both groups reduced calorie intake to a similar degree, those taking Orlistat were absorbing fewer calories. Therefore it’s possible that the energy deficit in this group was much greater than it appeared to be, and this is supported by the significantly increased incidence of bowel incontinence and diarrhea. Collectively, these studies suggest that carbohydrate intake plays a strong role in the regulation of appetite. Selective reducing carbohydrate intake leads to spontaneous reductions in food intake that match what people are able to achieve by actively restricting total food, fat, and calorie intake. Further, if the low fat dieters were able to eat to satiety, or until no longer hungry, then they wouldn’t need to actively restrict food intake and count calories; this doesn’t happen. In other words, this means they’re still hungry. Thanks for the article. You should also mention leptin and ghrelin, two "hunger hormones" which are affected by carbohydrates. Basically, lowering carbohydrates lowers tryglycerides, and tryglycerides prevent leptin, the satiety hormone, from crossing into the blood-brain barrier, so the brain doesn't tell you to stop eating. Could we substitute milk with almond milk for coffee or tea ? and also what happens when we eat carbs more than our daily limit? Does it kick you out of ketosis. Secondly, when it comes to vegetables, you don't have to limit your consumption of non-starchy vegetables. There is something like a "zero-carb" trend which is, in my opinion, unnecessary. You can learn more about carbs here: Total Carbs or Net Carbs: What Really Counts? Hi, i am doing the keto diet since a week but i am missing a lot my coffee with milk and stevia. Can i have a cup once a day or it will jeopardize my diet? Hi Ihina, yes, you can have coffee but try heavy whipping cream instead of milk. Stevia is fine, just like Erythritol. I tried the Keto Diet and after three days I started blowing sharts all day and night. There is no shape to my bowel movements, they are a liquid goo that coats the inside of the bowl. These episodes come without warning so I cannot be more than 50 yards from a bathroom at all times. Some of my co-workers have complained to my boss about the sounds and smells emanating from the bathroom when I use it since I have started this diet. He offered me a slice of bread to resolve the issue. Any suggestions? Hi John, I think it's silly if they really complain about that. You may be eating too much fat, especially MCTs - do you eat coconut oil or MCT oil? Some people seem to have issue with more fat or certain foods they may be intolerant to. Do you eat enough fibre / vegetables, probiotics, bone broth? All these foods may help. Hi Bill, I started following this diet about 6 months ago. At first, my appetite went down but I have recently experienced cravings and I feel more hungry. The only thing that has changed is that I started using xylitol (just a few times a week a tablespoon or two) and I also exercise more (2-3 times a week cardio, once a week yoga). Could this be related? It's possible. The easiest way to tell is to cut back on the xylitol and exercise for a week or two and see if the hunger subsides. Are you following this diet to aid in weight loss? If you're trying to maintain weight loss (ie, stable body weight), then it gets trickier. More monitoring may be warranted. Just got Bill's book and love it, it's exactly what I was looking for. there is so much misinformation on calories these days and this book makes it clear. Thanks for the article! I have been sleeping better at night! My pain in my knees is almost gone! My attitude has been great! Did I mention.... I am never hungry! I can not imagine going back to any other life style! This is the easiest diet I have ever done! Since going low-carb, I eat at least 30% less than what I used to and I know this because I'm tracking everything I eat. I lost over 40 pounds and I would never go back. Low-carb is simply the best way of eating for me! Hi I've been on and off the ketosis diet for a few months all been ok at first losing weight and feeling better, but this time I've been unable to maintain a high keto level I'm more out then in but I'm eating the same foods as before. My poo is a lot lighter in colour than normal if read up on it it's called steatorrhea how to I correct this to get back into ketosis. Hi Stewart, it depends what your goal is. In most cases, you don't need to aim for high ketone levels: Ketones and Weight Loss: Do Ketone Levels Matter? How much fat (in grams) are you eating? You may want to talk to your doctor just to rule out other reasons (here are possible causes for steatorrhea: https://en.wikipedia.org/wiki/Steatorrhea).